Most of the Oregon faithful got their first glimpse of Austrian-born defensive force Thomas Schaffer (3-Star/Lake Forest, Ill) in the infancy of the 2015-16 recruiting cycle. Now heading into the summer months, Schaffer remains a hot topic around Oregon’s defensive line as Ron Aiken continues to make inroads to gain the international’s signature. He has been trying to get on campus since an official offer was extended and maintains he will make Oregon a priority for an official visit in the fall. Stay tuned! To view Schaffer highlights, please click here. Oregon’s pull in the Chandler, Arizona, area has been well-known over the past decade. Another prep now seems poised to follow former Ducks to Eugene. Chase Lucas (4-Star/Chandler, AZ) has yet to settle on a position at the collegiate level but, nonetheless, is finding communication aplenty from the Ducks. “Oregon is looking at me for corner, and coach [John] Neal will be by next week on Tuesday. 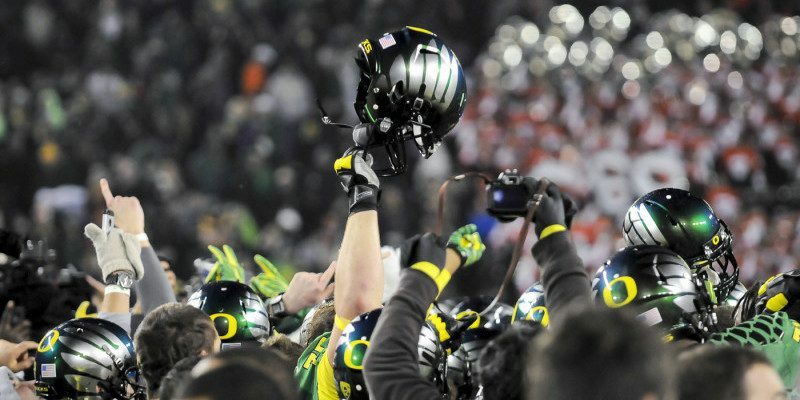 If Oregon offers, that will be a huge honor for me,” said Lucas. A 5’11, 177 lb. jack-of-all-trades, Lucas is the type of prep who could be steered towards a spot on the depth chart only to come into camp and move around. However, the uncertainty isn’t an issue for the Southwest prep, who’s taking everything in stride.